The method getDescription() is inherited from Describable and has to return a Description.Descriptions contain the information that is later being exported and used by various tools. For example, your IDE might use this information to display the test results. The generic type parameter FrameworkMethod is basically a wrapper aroundjava.lang.reflect.Method providing some convenience methods. In getChildren() the test class is scanned for methods annotated with @Test using reflection. The found methods are wrapped in FrameworkMethod objects and returned. describeChildren() creates aDescription from the method name and runChild() finally runs the test method. BlockJUnit4ClassRunner uses a lot of protected methods internally. Depending on what you want to do exactly, it can be a good idea to check BlockJUnit4ClassRunner for methods you can override. 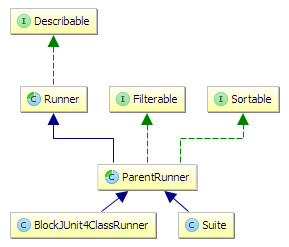 You can have a look at the source of BlockJUnit4ClassRunner on GitHub.